Jumeirah Beach is named after the Jumeirah district of Dubai. It is a white sand beach on the coast of the Persian Gulf. It terminates between the southern ends of the Jumeirah Beach and stretches along the coast south of the city’s historic district to the junction. 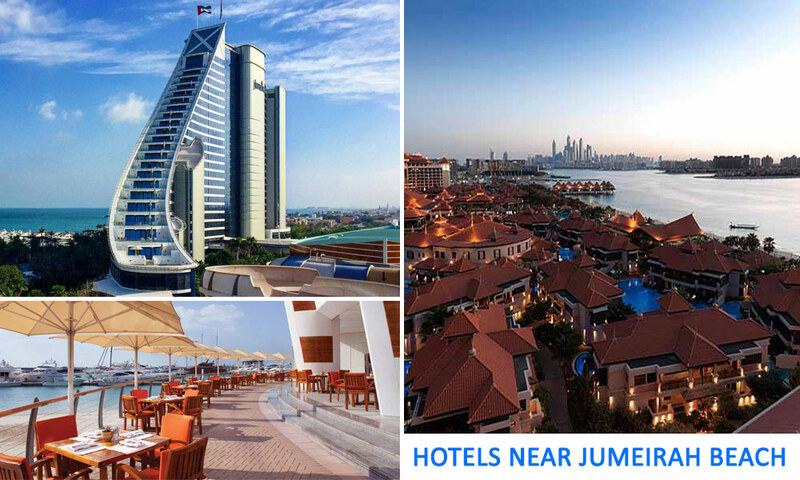 In this article we are reviewing some best hotels near Jumeirah beach Dubai. One of the best hotels near jumeirah beach, Jumeirah Beach Hotel is something you’ll get to hear about a lot once you reach Dubai. This extensive beachfront hotel in a an outstanding building with a wave like shape overlooks the Arabian Gulf and is just 6km from the indoor ski resort “Ski Dubai” at the Mall of the Emirates. Rooms: It offers upscale rooms with gulf views and also features floor-to-ceiling windows, luxury toiletries and free Wi-Fi. Other amenities include iPod docks, flat-screens, as well as the facility of coffee and tea makers. Suites and upgraded rooms include seating areas and balconies. Luxurious villas have 18-carat gold plated bathrooms. Other facilities include 20 restaurants and 6 pools and bars, also offers an Italian eatery. You will also find a spa, a gym, a private beach and a dive centre. This hotel in Dubai Jumeirah Beach is suitable for a all type of tourists. Location: It is located at the East Crescent Road Palm Jumeirah. It is only 13 km from the Emirates Gold Club and 16km from the Mall of the Emirates. Rooms: Features balconies or terraces with the most mesmerizing views. Free Wi-Fi is provided in the refined rooms, Bose audio systems and flat-screen TVs. 24/7 room service is available. Apartments and suites add living rooms, kitchens, dining areas and some also include butler service and a private club access. The Villas have pools. Other facilities include 14 choice eateries, bars and 6 pools. You’ll also find a French-Polynesian styled spa and a kid’s club. Water sports and tennis is also available. Every room is well-equipped. Sofitel Dubai the Palm resort and spa consider one of the best service provider hotels near jumeirah beach. Location: It is located just by Crescent Road. This luxurious hotel in Dubai is perfect for a memorable trip with the family. You’ll find a beautiful Thai-themed hotel with villas set around lagoon-style swimming pools which are just 5km away from the Aquaventure Water Park and only 18km away from the Emirates Gold Club. Rooms: Stylish rooms feature balconies or terraces, smart TCs, free Wi-Fi, floor-to-ceiling windows. Upgraded rooms add direct pool access, glass floors, over-water villas, extra bedrooms or private infinity pools. Room service is offered 24/7. Other amenities: It includes free breakfast, a private beach, 4 restaurants and a spa, 2 gyms, a Turkish bath. Water sports as well as Thai cooking classes are available. The unique experince provided by Anantara resort puts it in the list of best hotels near Jumeirah Beach Dubai. Location: It is located just off Sofitel Dubai Jumeirah Beach on the JBR “The Walk”, the beach. It is just 16km away from the Wild Wadi Water Park and the Mall of Emirates. Rooms: Advanced rooms feature stunning sea views and balconies, flat screen TC, DVD players, free Wi-Fi and many other amenities. The rooms are very well-equipped. It also offers the facilities of great sound system as well as tea and coffee makers. Upgraded rooms include butler service, Nespresso machines. While suites and apartments include sitting areas, access to the private lounge and iPod docks. Some also offer whirlpool baths, living and dining rooms. Other Facilities: It adds 2 restaurants and 2 bars. You’ll also find a spa, a sauna and a fitness centre. Parking is also free. Location: The Four Season Resort is located on 2 Jumeirah Road. It is just 8km away from the beachfront luxury resort with a modern Arabian Style and 11 km from the Dubai World Trade Centre. Rooms: The advanced rooms’ features beautifully furnished balconies with city views or Arabian gulf. You’ll also find tiled bathroom with designer toiletries and separate tubs. It also offers the facilities of sofas, iPad minis, free Wi-Fi and flat screen TVs. Living rooms and Suites, some have fitness areas and some have kitchens. Room service is 24/7 available. Other facilities include stunning bars and beautiful 10 restaurants. It also offers 3 pools, one of which is indoor, a 24 hour gym and kid’s club. For outdoor activities, it includes Tennis, paddle boarding and kayaking. Parking is also free. These are some of the best and recommended hotels near Jumeriah Beach Dubai. If you have stayed in any of the above mentioned hotels and would like to share your experience, please do so by adding comments below.